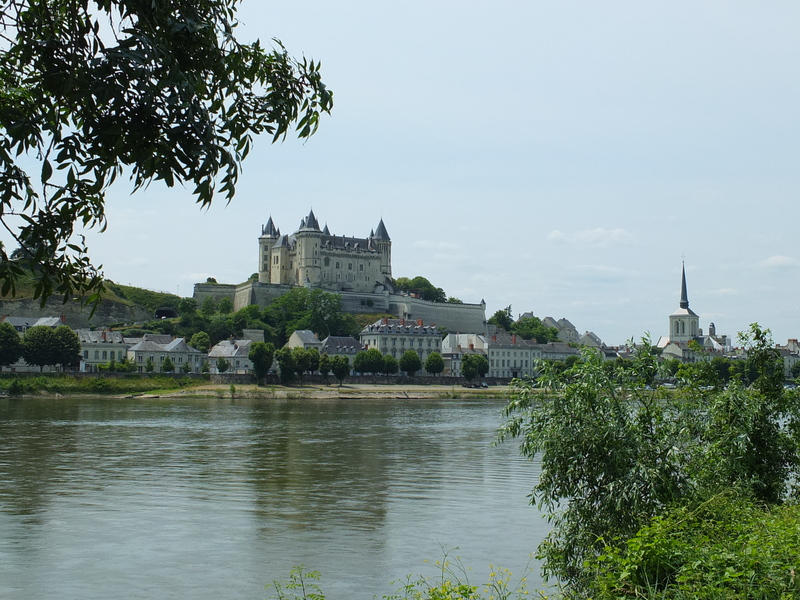 We spent the last week of June in the Loire Valley, France, in a city (but felt more like a town) called Saumur. I’ve not seen a massive amount of France, which I guess is quite strange for someone living in England. Having had Elohdi living out there for the past 8 years trips have usually involved visiting her so I’ve been to Paris maybe more than most, and spent time in and around Nantes. So when I met Chris just over 2 years ago and he made it clear that his idea of holiday bliss is driving to France it was inevitable that one day, the roadtrip would get planned. I took a huge step out of character and left the route, destination and overall control to him and we booked a week in a mobile home in Saumur. Famed for it’s fizzy wine, I knew very little else about the area until a few weeks before we left when Elohdi told me that there was, amongst other things, a plate museum, a tank museum, and some mushroom caves? So I packed 3 books and hoped for the best. After an incredibly long drive, not helped by the fact that we had driven to Dover through the night on Friday, we arrived at Flower Camping in Saumur, greeted by several people driving around on vintage bikes with fake moustaches and stripy shirts on. No, it wasn’t all the stereotypes I’d ever come across being realised, it was Anjou Velo Vintage, the annual festival of all things vintage cycling that was taking place in the town that weekend. Seeing people handle their bikes so well made me realise that one of the things on my mental itinerary was probably not going to happen that weekend. Two people who don’t cycle in the UK shouldn’t assume that being in France automatically makes you able to do it well, especially when one hand is holding a French stick. The mobile home was perfect, exactly how a caravan should be, terrace with garden furniture, miniature bedrooms, and most importantly, a fridge for the 40 beers we’d bought at the supermarket as a matter of priority on arrival. My first thoughts of the place were that it seemed a very relaxing place to spend a week. It’d chucked it down all the way there, torrentially in parts, and I was relieved I’d brought all the books. But by the second day there the sun was well and truly out, and well and truly relax we did. The campsite had a pool complete with loungers, and we spent 3 days doing not a lot more than graze on ham, cheese, pate and bread, drink stubbies and re-apply suncream. I also started ‘Gone with the wind’ which became slightly consuming and is now proving a bit of a bind now I’m back at work. 984 pages is a lot of pages. I was amazed by how quiet the site was, though given that it’s the second week of July now and temperatures are close to 30C as the summer holidays approach, I imagine that the holidayers who we met spending their retirement in their camper vans will have moved on, leaving the place swarming with kids. It catered for all kinds of camping too, small tents met huge Winniebagos which were absolutely amazing and inspired a lot of jealousy, and there were a variety of different mobile homes for those wanting the in between. The town itself was pretty but not as big as I expected, sat under the hill which housed the Chateaux. Having reached the decision early on that we wouldn’t be paying good money to look round any of the aforementioned museums, we also gave the Chateaux tour a miss…seen as we could see it from our mobile home it seemed unnecessary to pay to look round it when we could just look at it from our seat in the sun. We made the journey into Nantes to see Elohdi and family, and then came home the VERY long way, the touristic route apparently, driving through pretty little villages and towns, windmills, vineyards and Chateaux’ as a pre-requisite, before picking the river back up to come back to Saumur. I still can’t get over how easy it is to navigate the roads over there, you know what road you’re on and where it’s going, pretty much constantly, can’t really say that for over here! Our last day was pretty overcast, so we managed to get free tickets to go and look round one of the wineries, which involved a 30 minute tour of the underground galleries. 4 million bottles of wine down there. Amazing. This was rounded up with tasting of 4 different fizzy wines, including a fizzy red which was pretty good considering it sounds hideous. All in all, despite our leisurely approach to getting to see the area, I think I got a pretty good feel for it. It was chilled, the town was pretty calm to say it is officially a city, and walking around on the couple of nights we decided to eat something different than ham for a meal felt perfectly comfortable. We had two amazing meals in the medieval square, and even got live music on the last. And of course, there was more than a couple of my favourite French thing, the oranges and fire. God love Cointreau. Having been back 8 days I’ve already forgotten the very long drive, to the point that I’d even consider adding on more mileage next time. It was the place where the Winniebago plans were laid, and I now have written documentation of how long this could take to happen. I’d recommend it to anyone looking for a relaxing week in the sun, nice food, and a great site, and if you’re into cycling then it’s perfect as the place is surrounded by trails. Great week feeling more relaxed than I have in a while. Definitely would say a week is long enough though. Next stop, Budapest. This entry was posted in Travelling and tagged camping, chateaux, cycling, driving, france, loire, vineyards, wine. Bookmark the permalink.